Police Tuesday are searching for a motorist who fled after fatally striking a man pushing a shopping cart across a National City roadway. The pedestrian, a 49-year-old San Diego resident, was struck in the 3100 block of Highland Avenue shortly after 10:30 p.m. Monday, according to National City police Sgt. Mike Harlan. He died in the back of an ambulance while being taken to a hospital, Harlan said. The motorist who struck the man was driving a gold or silver vehicle northbound on Highland Avenue, Harlan said, noting the vehicle likely has front- end damage. “After striking the victim, the suspect vehicle made a U-turn and was last seen heading westbound on state Route 54,” he said. 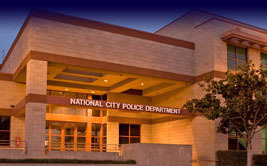 Anyone with information about the hit-and-run was asked to call National City police at (619) 336-4411.